Everyone was right. You wouldn’t give an alcoholic a glass of wine, why let a gambling addict gamble? It was just another case. Remains were found in an industrial shredder, which seems very typical of ‘Bones’. Then Angela found poker apps on the victim’s cell phone. That might not seem odd, but he was a member of many sites. Then they spoke with a co-worker the victim had a fight with and found out Jeff was in deep. All the players on the underground poker game were suspects, which meant, Booth had to go undercover. Brennan wasn’t happy about this and neither was Aubrey. They both pleaded with him not to do it. But he didn’t want a killer to go free. He wanted to see all of the players tells and the way to do that was to play with them. He told Brennan he was strong and wouldn’t relapse. He would be fine. It looked liked he was a little nervous when he sat down, but he quickly got into the game. Then he noticed a camera. He went to the bathroom and called Angela to see if she could hack into it. She could, but she needed his phone to be close to the security system. Booth claimed another player had string bet, which was an illegal bet. Can there really be an illegal bet in illegal gambling? Booth asked to see the tape. This got him close enough for Angela to do her magic. Breaking into the security system didn’t lead to much though, just who was there on the night of Jeff’s murder. Booth got home at 4a.m. and Brennan was waiting. She was very worried about him. She asked if he called his sponsor and he said that was between him and his sponsor. When Brennan said he didn’t, he said he called him on the way home. 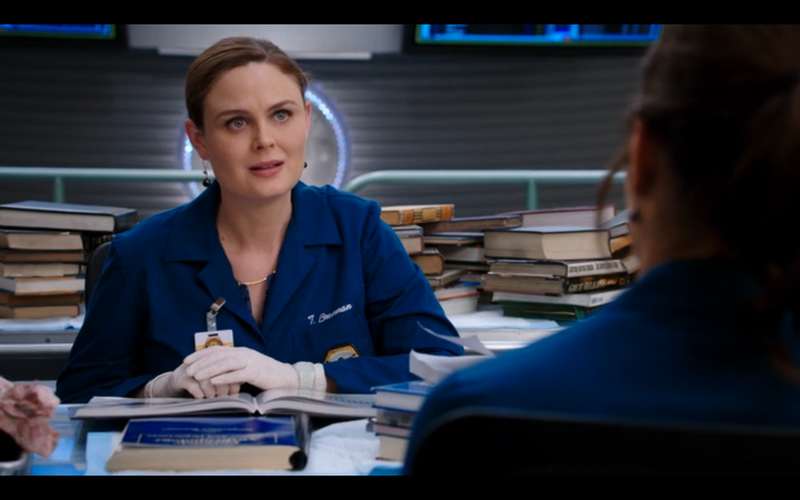 Brennan read something Sweets said that even a good, big emotional change can trigger a relapse. 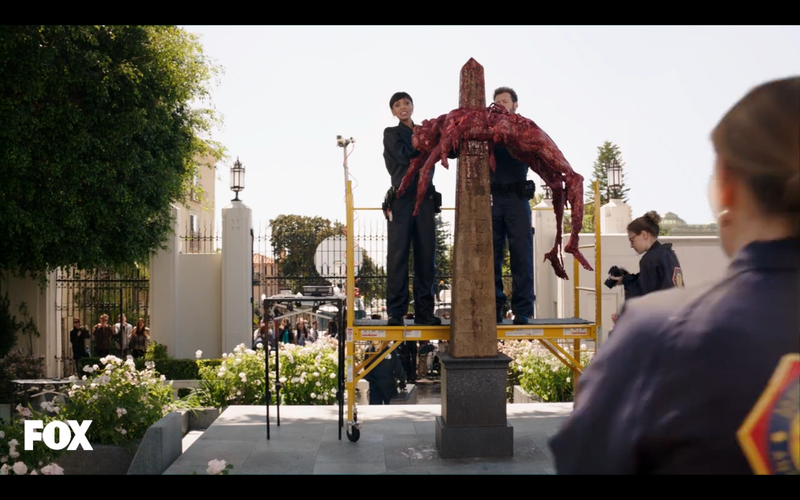 Booth got very mad at this. 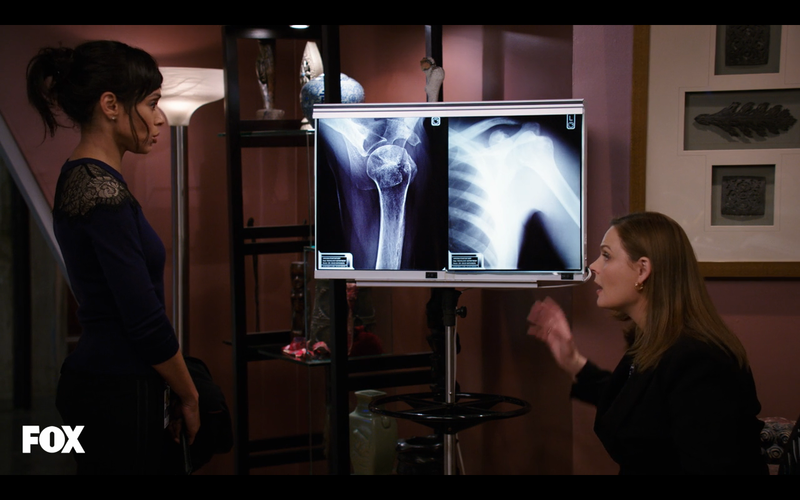 He thought Brennan didn’t believe he was strong enough because they were having a baby. He said they should go to bed because she was sleeping for two. Aubrey tried to talk to Booth. His father lost everything in the stock market and then started a Ponzi scheme. Aubrey said he thought him and his mother would be enough. Booth told Aubrey it wasn’t them, it was his father. It was him. Aubrey said Booth could call him if he couldn’t get a hold of his sponsor. All the players seemed like regular people and they couldn’t get the financials of the suspects because they didn’t have cause for a warrant. Booth said he was frustrated. Booth said he had to go back in. Brennan and Aubrey pleaded with Booth to give them time. Booth came up with every excuse, don’t want them to get away, don’t want the killer to see they are on to him. He had to go in and mention the murder. Then he could see who did it. Aubrey said you catch the guy and you’re out, right? Booth hesitated before saying yes. Aubrey and Brennan were not reassured. Booth was in the game a long time and winning big. Angela was looking at financials online. She said you don’t need a warrant online if you know where to look. Aubrey said whatever gets Booth out faster. Even Miss Warren was trying hard to end the case quickly. She stayed at the lab all night looking at the bones. Hodgins’ found evidence from particulates that showed Thai food. There was a Thai food place close to the poker game. They investigated the alley and found the victim’s throat had been ripped out. There was also wood in the throat. Hodgins examined the wood and it came from a bat. Angela also found that Nate Crow had financial problems. He was about to lose his house after his divorce. He just made a big payment. They looked at the suspect’s Facebook page and found a baseball bat with the same make as the particulates Hodgins’ found. They had enough evidence to take Nate in. Brennan texted Booth, but he had a good hand and could stand to make a killing. He hesitated for a while. Everyone at the lab looked on worried about what he was going to do. He finally brought out his badge and arrested the guy. 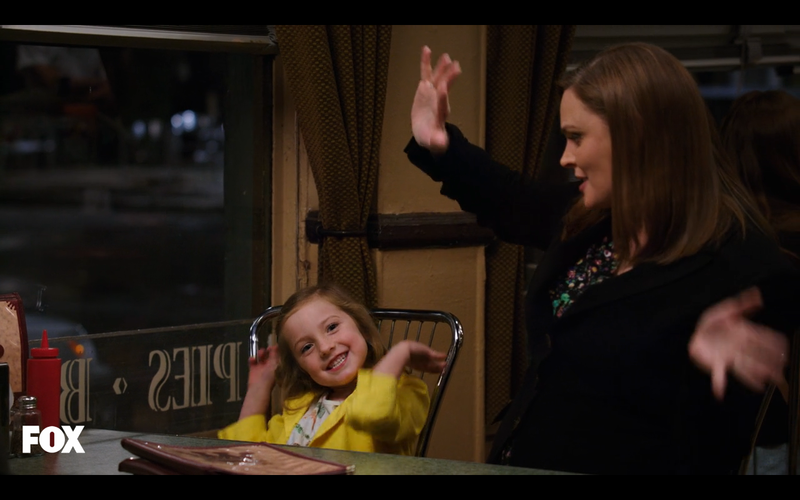 Brennan looked so happy. Everyone was so relieved. If only that was that. 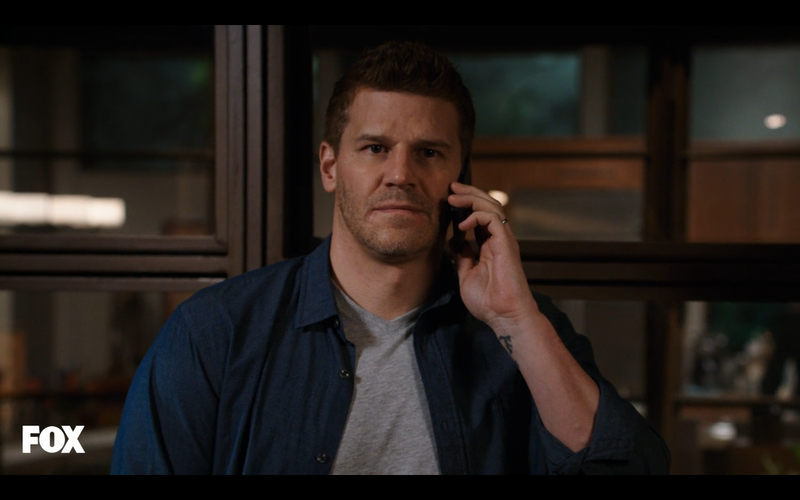 Booth lies to Brennan at the end of the episode and tells her his sponsor is calling. It wasn’t his sponsor, it was his bookie. He wanted to put 200 down on the Cardinals. His gambling problem is back. On two happier notes. 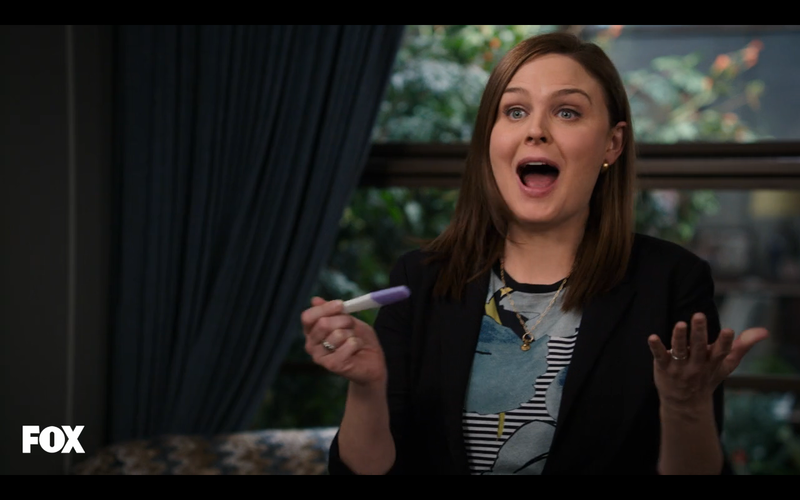 Booth and Brennan are pregnant! 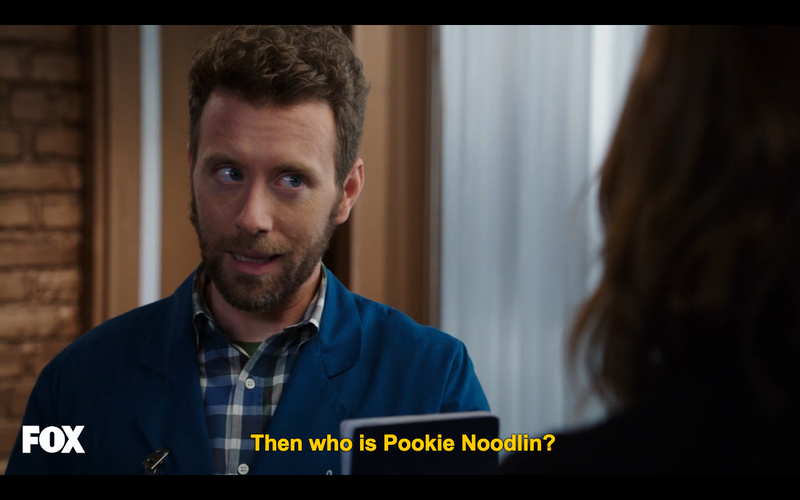 And Hodgins just invented something that will bring back his money, well probably not all of it, but still. Cam told him to play with his inventions home and he did, so the Jeffersonian can’t take credit for this one. He created a mat that stops beakers from breaking. Miss Warren helped him with this idea. He was breaking beaker after beaker, and test tubes. She said to make an unbreakable beaker. So he went with the idea.